WARNING: I am going to be talking about the topic of death - something not many are comfortable discussing, but something that happens to all of us nonetheless. Proceed at your own discretion. Also, everything in this article is based on my own experience and research. Always speak to your physician before starting new diet or exercise programs. 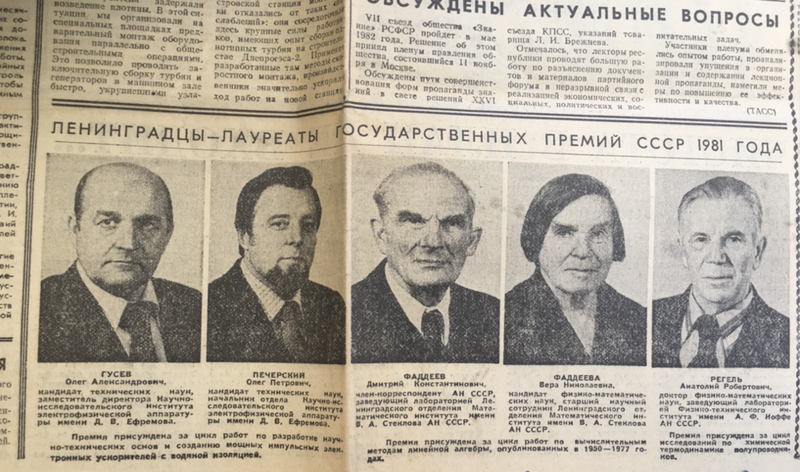 The above is an extract from a Soviet newspaper; the title reads "1981 USSR State Prize Winners from Leningrad." That's my grandfather above (second on the left). He was born in 1936 in Rostov-on-Don and became an orphan during WWII. Fortunately, he was adopted by a loving family that encouraged and supported his pursuit of education. He would later go on to run the 300 person NIIEFA-ENERGO Research Institute in Saint-Petersburg, and ultimately win the prestigious State Prize for his work in the field of physics, twice. As a head of our family, he hosted all our family get-togethers, rallied us to our dacha in the summers, brought us on ski trips, and taught all the kids in the family to drive a car with a manual transmission. Suffice to say, he was much loved and cherished by us all. In 2005 at the age of 69, he passed away from a cardiac arrest. This was the first time I had experienced a person close to me dying. In retrospect, being 17 years old at the time, I don't think I fully grasped the full context of this event. By this I mean, although devastated by his loss, I thought that it was a natural event seeing that he was 'old'. Only now, as I grow older, do I realize that 69 isn't all that old. I also have come to realize that elements of my Grandfather’s lifestyle contributed to his early death. Listen, there are really three ways your life will go down. First, you live a long healthy life and die fast when you are old. Second, you become disabled way before you die and live handicapped for years before you die. Third, you die way before you even have a chance to get old. Like it or not, the reality is that sooner or later, we'll all end up under the ground. The problem is that we as humans are terrible at accepting this reality – and I concede that it is an unpleasant reality to wrestle with. Rather, we preoccupy ourselves with jobs, errands, entertainment, travel etc. and decidedly ignore this fact of life until the time when we are forced to confront it. What’s more is that we have a hard time noticing the passage of time because the changes in our physicality are so subtle, and generally occur fairly gradually. We look in the mirror daily but the effect of time on our bodies is largely unnoticeable – only when we look at our old photos do we notice the change. "I can't believe it is me. It feels like a different life! ", I frequently find myself saying looking at old photos. Because we are so bad at noticing the daily changes that are happening to our bodies, we assume that everything is staying the same, and will go on staying the same. But of course, it won’t. Don't look at violent media headlines. That's not what will get you. It is very likely not going to be a plane crash, a shark, or a terrorist attack. In the United States, you are about 160 times more likely to die in an impaired driving accident than from a terrorist attack. So first thing to do: don't drink or smoke weed and drive! As you can see, most causes of death are health-related. An overwhelming percentage, half of all deaths, are attributable to cancer and heart disease. Nobody dies from old age. One (or several) of your bodily systems deteriorates faster than the rest and ends up killing you. So, arguably, part of maintaining your health is identifying your weakest link and making sure you address it before it irreversible. I won't spend too much time on the option THREE because these things are often outside of our control. Just don't do stupid things that can easily kill you -- roofing, drinking and driving, or racing motorcycles in traffic. It seems that our best option is to increase the healthy lifespan and move from option TWO to option ONE. In the process, you may also increase your overall life expectancy which is an added bonus. One of the primary difficulties in addressing health issues is that of accurate diagnosis of the problem. Take for example neurodegenerative diseases affecting the brain such as Parkinson’s or Alzheimer’s disease (AD). These diseases have no known cure and carry a heavy personal and economic burden. However, early diagnosis remains incredibly difficult because there are virtually infinite number of biomarkers (usually a biochemical substance in an organism whose presence is indicative of some phenomenon such as disease, infection, or environmental exposure) that can be identified in a patient who is diagnosed with a disease. The problem is complicated by the fact that no biomarker is diagnostic – that is, one has to deal with false negatives (just because one doesn’t have an elevated level of the biomarker, doesn’t mean one doesn’t have the disease) and false positives (just because one has an elevated level of the marker, doesn’t mean one has the disease). Similar challenges exist with genetic markers (DNA sequence that causes disease or is associated with susceptibility to disease). Genetic markers of most diseases do not have complete penetrance (complete penetrance means that if you have the genetic defect, you will develop the disease). There are some diseases where it is the case, but in very few. For example, in breast cancer, about 12% of women in the general population will develop breast cancer sometime during their lives. By contrast, a recent large study estimated that about 72% of women who inherit a harmful BRCA1 mutation and about 69% of women who inherit a harmful BRCA2 mutation will develop breast cancer by the age of 80. (Read more here.) So even here there is incomplete penetrance. To add to the complexity, we know now that many diseases have epigenetic origins, so that even genetically identical people (e.g. homozygous twins) can have different cancer risks due to different environmental exposures. Now you understand just how complex the question of prolonging healthy lifespan is. What follows is an overview of my strategy. Simply put, this strategy involves a) gaining a better understanding of our unique bodies and taking personal responsibility for our own health, and b). take preventative measures to mitigate the risk of illness and and proactive measures to prologue healthy lifespan. You likely already know (find out if you don't) if your family has a history of degenerative diseases (medical condition that causes a tissue or organ to deteriorate over time due to genetic or lifestyle choices). Your risk may be elevated if that's the case. Someone in your family had lung cancer? Don't come even close to a cigarette. While smoking tobacco alone is the leading cause of developing lung cancer, genetics can also play a role in increasing the likelihood of the disease. You can read about it in detail here. We have considerable evidence indicating that alcoholism may be, at least in part, genetic. If someone in your family struggles with alcoholism in your family, be attentive to your alcohol consumption habits. Another example is the BRCA breast cancer gene which studies have shown increase the likelihood of developing breast and ovarian cancers at younger ages than people who do not have these mutations. Genetic tests are an increasingly popular way of gaining better understanding of your own body and the potential personalized health risks. You can read more about the pros and cons of these types of tests here and here. For my part, I have just conducted 23andme test and I will report on it in a separate article. Take responsibility for monitoring your own health. Like many healthcare systems globally, Canadian healthcare system puts emphasis on patients that have urgent issues. It’s understandable why the healthcare evolved this way. With shortage in resources the emphasis is put where they are needed most right now. In the overloaded healthcare system where overworked doctors see dozens of patients a day, there is little capacity to think of preventative healthcare, instead putting their energy into patients that have clear symptoms of illnesses. Unfortunately, under this setup, often by the time we get around to noticing symptoms of something potentially serious and seeing a doctor, the issue has likely progressed to a higher degree of severity, thereby becoming increasingly challenging to treat. There are many reasons why it’s hard to move away from the reactive healthcare system we have now – resources, education, systems integration, and more. Therefore, it’s important for you to take the lead in owning your own individual lifelong program for expanding your healthy lifespan. Work with your family doctor together to develop an action plan personal to you. I have informed my doctor I want to live to be 100 years old. She laughed but then gave me homework. You have to be proactive and pushy here. Keep some form of a journal to document changes in how you feel. Two years ago, I found myself getting poor sleep and being pretty tired throughout the day. I cut out coffee and I have felt a significant improvement in my energy levels. If you rev your car’s engine at every stop light, brake like a maniac, and run it over potholes at high speed you will naturally wear down your car and its parts faster. It’s the same with your body. There are many articles written about this topic, but I wanted to include my own perspective for the sake of completeness of this article. Taking care of your body three basic things: physical activity, nutrition, and mental health. SO: exercise, eat well, and chill out. Done. Ha! Easier said than done. To simplify matters, I present you the Triangle of Longevity v1. Why V1? because I don't know everything and I am sure it will evolve as I continue exploring the topic. Why in the hell it on its side? Well, that's so you don't think that one aspect is more important than the other. Consider taking supplements. I have been taking basic fish oil for the past 2 months and I feel that I am sharper. Research has shown omega-3 (found in fish oil) has positive effects on cognitive performance. I have also tried CBD oil and it has really calmed the mental circus I put my brain through every day. Meditate. It's super hard and something I am not good at yet, but whenever I do it, it levels you very well. Exercise. Like your body, your brain needs exercise. Studies have shown that certain types of mental activity have slowing effects on mental deterioration in old age. Try to do mental math where you can, forgo that next episode of Netflix and train up your brain muscles to read instead. Play memory games with yourself. Make an active effort to understand concepts of things that may at first blush seem too complex for you to understand. (Are you reading Wait But Why?) Bust out that pencil and paper. Study a different language. Strengthen your cardio. Rigorous cardiovascular exercise is important to strengthen your lungs and, it is a well known fact, also contributes toward burning fat. It’s never too late to start injecting a bit of cardio into your weekly routine. This can be as simple as making a conscious effort to take the stairs more often. Bike to work. Go swimming or for a hike on the weekend. Join a cardio class or running group. Personally, I have found that Muay Thai and Krav Maga over past couple years have been an incredible way to train up your cardio, build muscle, and has astonishingly positive effects on my mental health. Build muscle. As we know, carrying excessive fat on your body is bad and can lead to diabetes, heart diseases, and certain types of cancer. We have already covered cardio as one approach to reducing fat. A lesser known fact is that building muscle is equally key to burning fat and keeping it off. Unlike cardio when you burn fat really only during the exercise, building muscles help continue to burn fat for hours after as energy is needed to rebuild the stressed muscle fibers. Stretching is important. Something I have neglected and now paying for it (in pain and physiotherapy bills). Because of not stretching my arms, I have built up scar tissue that hurts my nerves. Every time I lift anything I have sharp pain shooting up my bicep. Not fun. I hope it will go away with more physio, exercises, and stretching but if I were to leave it unattended for longer I could have created a permanent damage. Stretching becomes increasingly important as you get older. a). Consider eating organic. The Dirty Dozen / Clean Fifteen. Is handy guide to help you decide what products should be purchased organic. The lists were compiled using data from the United States Department of Agriculture on the amount of pesticide residue found in non-organic fruits and vegetables after they had been washed. Eating organic is expensive, so this guide can help you selectively purchase organic produce based on pesticide toxicity risk level. b). Cut back on processed everything. Processed meats, processed grains, and sugar. Often, we don’t even realize we are eating processed foods because it is so prevalent. Processed food, baked goods and breads, canned food, lunch meats are also great at tricking your brain by being very tasty. But have you ever watch videos on Youtube about how processed meat is made? Literally, pick any of them and be petrified. Put down that prosciutto. Wow! What about a conclusion with some words of encouragement and "you can do it!" rant? I bet THE END was a bit unexpected. Guess what? That's how it all ends -- by surprise. Start investing in yourself now.